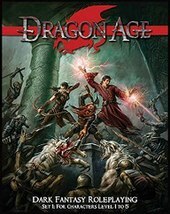 Dragon Age is a role-playing game published by Green Ronin Publishing in 2010. It is based on the Dragon Age video game series by BioWare, and uses the video game series' setting. The game uses traditional tabletop role playing game features, such as character classes (fighter, mage and rogue), races (human, dwarf or elf), and ability scores. Gameplay in the system centers around the use of three six-sided dice for all rolls. One die, called the "dragon die", is differently colored than the other two. When doubles appear on any roll, the player can perform special actions called "stunts", based on the value on the dragon die. The game's initial release was as a boxed set including a Player's Guide, Game Master's Guide, map of Ferelden and three dice, and covered characters of levels 1 through 5. Second and third sets, covering levels 6–10 and 11–20 respectively were later released. A single hardcover compilation of the rules was released in May 2015. ^ "Dragon Age RPG: Dark Fantasy Roleplaying". Greenronin.com. Retrieved 2009-11-08. ^ Shannon Appelcline (2011). Designers & Dragons. Mongoose Publishing. ISBN 978-1-907702-58-7. ^ "Dragon Age RPG Core Rulebook". Green Ronin. Retrieved May 8, 2015.